The Cabbage Soup Diet if followed strictly can help reduce 2 to 2.5 kgs in 7 days. Abstain from sweets, sugar, colas, tea, coffee,soda, alcohol etc and drink lots and lots of water through out the day. Cabbage Soup should be taken every day. Also do some exercise daily.The food intake should be divided into 5-6 mini meals everyday. The plan is given below. Day 1 : Eat fruits like melons, apple,orange,papaya etc . Do not eat Banana today. 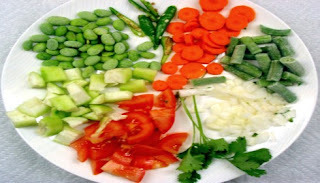 Day 2 : Eat Raw Vegetables like Tomato, Cucumber, Carrot etc. Lunch can be stir fried vegetables with onion and garlic in very less olive oil or steamed vegetables and a baked potato. Avoid sweet corn and green peas. Day 3 : Eating a combination of fruits and vegetables eaten on day 1 and day 2, except potato. Day 4 : Eat only bananas (6-8) and drink skim milk. Day 5 : Eat 3 baked or grilled skinless chicken or fish meal today and around 6 tomatoes.Vegetarians can substitute with tofu. Day 6 : Eat 3 steaks and vegetable salads today. Avoid Potato. Day 7 : Consume unsweetened Fruit Juices and Raw Vegetables. good and the viewers are actually sharing goodd thoughts.